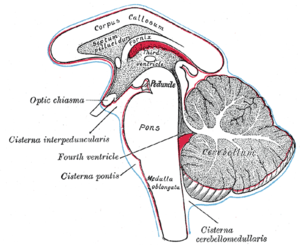 The pons is part of the hindbrain, the ancient rear part of the brain. It acts as a bridge, and has nerve fibres connecting the cerebellum to the medulla oblongata. In humans it is above the medulla and below the midbrain. Mainly, its function is to carry white fibres ("wiring") which conduct signals from the cerebrum down to the cerebellum and medulla, and tracts that carry the sensory signals up into the thalamus. This page was last changed on 30 September 2016, at 01:44.